Hands on: Samsung Galaxy NotePRO tablet review | What Hi-Fi? Samsung has high hopes for Galaxy NotePRO in 2014, with this new 12.2-inch tablet boasting a whopping 2560 x 1600 resolution. We get the distinct impression that one of thing products Samsung is most proud of, and has the highest hopes for in 2014, is the Galaxy NotePRO. This is a 12.2-inch tablet (and if you think that looks big written down, it’s nothing compared to the reality of a tablet this big) with a whopping 2560 x 1600 resolution – that’s over 4 million pixels in total. It’s running Android 4.4 ‘KitKat’. Samsung suggests the Galaxy NotePRO is reminiscent in size to magazines, and there’s certainly something in that when holding the NotePRO in ‘portrait’ aspect. It’s arranged the minimal control buttons to be accessed in ‘landscape’, however – even the ‘Samsung’ logo reads in landscape – and when held like that it feels undeniably cumbersome. It’s light, though, at 750g (add a whole three grams more for the 3G version), and seems as well constructed as you’d expect from Samsung. At 296 x 204 x 8mm it’s winningly slim, too. The rear facing camera is 8 mega-pixels (the forward-facing for the selfie-obsessed is 2mp), there’s 3GB of RAM regardless of whether you choose the 32GB or 64GB version. Both can accept a microSD card of up to 64GB. 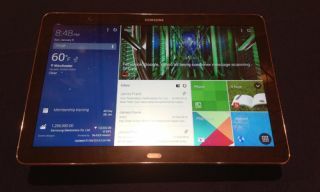 Samsung has moved the Galaxy NotePRO away from the more usual app-based home-screen, instead delivering ‘Magazine UX’. This is a series of customisable dashboard-style home-screens (the NotePRO can support up to five) that will be instantly familiar to anyone who’s used a Windows phone. Divided into sub-pages like ‘My Personal Space’, ‘My Workspace’ and ‘My Social and Media Space’, each page can be personalised by moving around different apps that dynamically update. Samsung intends Magazine UX to allow more information to displayed, and to be more readily readable, than app-based homepages. That big, high-resolution screen also allows fast and easy multitasking. As many as four windows (or four web pages, or four video calls or whatever) can be open at once, which makes the Galaxy NotePRO a serious business machine. Document editing has been optimised for Android, and thanks to remote PC access (and, to a lesser extent, the s-pen) the NotePRO can be used for even the most un-tablet friendly stuff like PhotoShop. The virtual keyboard has haptic feedback as well as many of the shortcuts instantly recognisable to PC users (a physical BlueTooth keyboard will be available at launch). In use the Galaxy NotePRO seems as fast, responsive and high-res as one would hope given the extensive spec-sheet. The size will take some getting used to, and the example we used felt a little more flexible and creaky than we were expecting, but if you’re in the market for a big, grown-up and powerful tablet this is inevitably going to appear on your shortlist. It’s now available to pre-order from Samsung's website for £649, with a release date of February 4th. It will set you back £649 for the wi-fi only version, but does come with a free Gamepad worth £59.